Hello Android fans and developers. I'd like to share with you some emulator skins I created for the Google Android SDK. This skin shows the black version of the long awaited and first to market Android powered smartphone G1 from T-Mobile in portrait mode. It is also known as the HTC Dream. 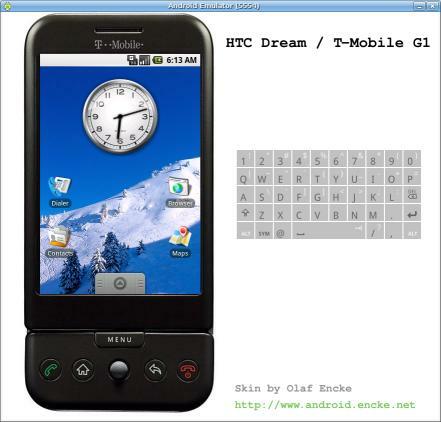 The HTC Dream/G1 was officially revealed on 2008-09-23. Unpack the zip file and copy the created directory and files to ./tools/lib/images/skins/ within the installation directory of the Android SDK. If you feel that I stepped on your feet and/or violated any of your rights please contact me and I'm sure we'll be able to resolve this matter to your satisfaction. Thanks.